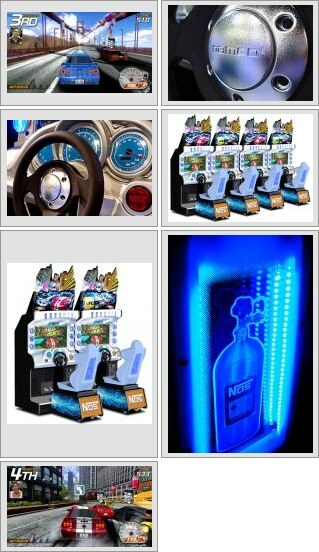 NAMCO's Dead Heat is the only arcade driver that incorporates social networking. Players that race each other are identified as "friends." The social networking tree expands as more and more friends race each other. Patented technology analyzes a player's driving style and saves that information to use as computer opponents in future races against friends using the PIN system. With this technology, players get to race friends that aren't even present. This state-of-the-art technology blurs the line between human and artificially intelligent opponents. When they use their NOS boosters to propel them to the finish line, it's their friend they just beat not just some anonymous computer car. Players return over and over to race the people they know and quickly establish loyalty to a specific location. Dead Heat's amazing HD graphics are unmatched with highly detailed and accurately represented cities. When you drive through Chicago, you're driving the real roads and not just some fantasy roads with a few landmarks thrown about the place. Players can choose between eight customizable licensed cars including popular Japanese and US cars.